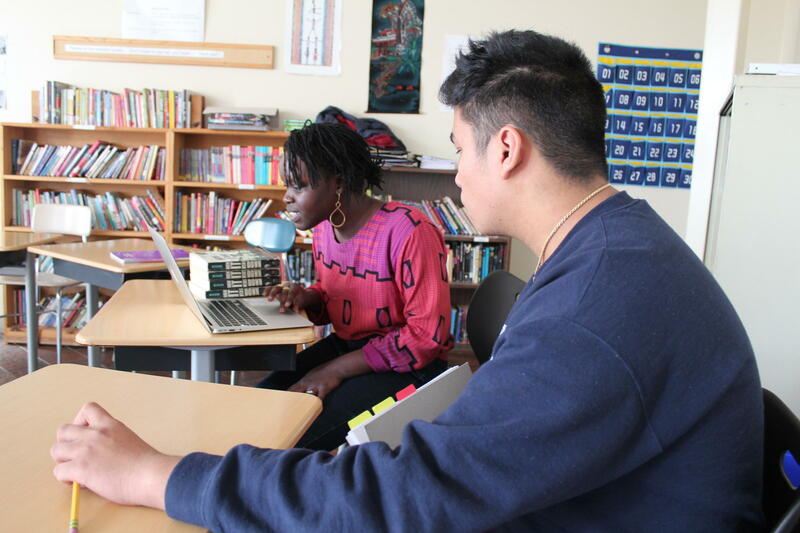 Teacher Sarai Manyiel works with students inside her classroom at Portland's Casco Bay High School. To become certified as a teacher in Maine candidates must pass certain tests of skills and knowledge. But some critics of the system say that there are cultural biases in the tests that are potentially keeping many applicants, including immigrants, from becoming teachers. The state has changed some its requirements in an attempt to address the issue. 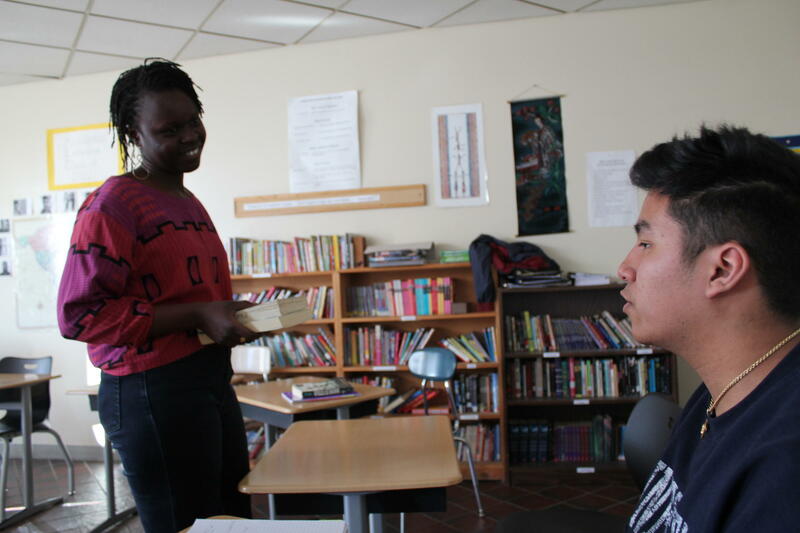 Sarai Manyiel teaches poetry and English at Casco Bay High School in Portland, where she also works with multilingual students. Manyiel is an immigrant herself, originally from Sudan. In class, she tries to tie in current issues; one day, the students spent half the class sharing presentations on different aspects of the Black Lives Matter movement. "So historically, looking at communities of color? What have they experienced?" Manyiel asks the class. It's Manyiel's first year teaching, but her journey into the classroom has been difficult. She moved to the U.S. as a child, and her family found its way to Maine. After graduating from college in Arizona, she moved back to Maine and taught at a cross-cultural preschool in South Portland. "I learned a lot from the kids there. A lot of things I didn't know, I learned with the kids," she says. "That inspired me to want to do that with older kids." So Manyiel decided to apply for an intensive teacher preparation program, called ETEP, at the University of Southern Maine. In order to enter the program, and to be certified as a teacher in Maine, she first needed to pass an exam called the Praxis Core. It's a basic skills test that's intended to assess what a teaching candidate knows in reading, writing and math. To be certified, Manyiel was also required to pass a second exam, in her specific subject area. The questions for both tests, she recalls, were confusing. One asked about various American accents. "That would ask you, what word is a northeast, north New England accent? Or southwest accent? Or Cajun accent?'" she says. "I'm like, I don't know! I've never been to New Orleans, I don't know people from New Orleans. Just things like that, that aren't really necessary." Manyiel had to take and re-take each test, sometimes up to four times, before she finally passed. "But I was like, maybe I shouldn't do this. I should go figure something else out," she says. "I should go somewhere else and do something else." While Manyiel ultimately decided to pursue her teaching career, many other similar candidates do not. Flynn Ross, the chair of the teacher education program at USM, says that in her 20 years in teacher preparation, she's encountered dozens of students, many of whom were non-native English speakers, who were qualified in almost every area, but became discouraged and dropped out. "They can have the GPA, all the courses, the experience working with kids, great recommendations," she says. "In every other way they can be recommended as great teachers. But they may not pass this single test." The organization that produces the teacher certification exam, called ETS, has even found that students of color performed significantly worse on the exams than white test takers did. ETS says it works with colleges to improve those numbers, and also continually reviews its tests for cultural bias. But the issue has led some of the state's teacher preparation programs to lobby to make the Praxis Core test optional and change the state's certification requirements. Doris Santoro, the chair of the education department at Bowdoin College, says opening the teaching profession to more immigrants and people of color is important for two reasons. "Because the research shows that when teachers and students are more aligned in their demographics, we have higher levels of achievement," Santoro says. "The other piece of that is that we need more teachers. And we have a labor pool that we are not tapping. That is just not smart." Officials with Maine's Department of Education say they've frequently heard that the test is tougher for non-traditional and adult students, particularly immigrants and refugees. That's part of the reason why the state changed its policy earlier this year, and will waive the Praxis Core requirement for anyone who passes another graduate-level entrance exam, such as the GRE, instead. Grace Leavitt, the president of the Maine Education Association, which represents the state's public school teachers, said in an email that the new change "seems to be a reasonable way" to address the state's shortage of educators and improve cultural and racial diversity. "Of course, we do want the professionals entering our schools to be well-prepared and do not want to see standards for certification lowered," Leavitt says, "but looking at more than test scores on one particular test to assess their preparation for entry into the classroom makes sense." Leavitt adds that she hopes the next administration will bring the "voice of fellow educators" to the table in determining these policies, including resuming the state's professional standards board for teachers. Some states have gone further in changing testing requirements. Sarah Barzee, the chief talent officer for the state Department of Education in Connecticut says the Praxis is no longer required to be a licensed teacher there, but is instead intended to be used as a diagnostic tool by colleges to determine what candidates need to know. In recent years, Barzee says that the number of teachers of color has begun to rise in the state. "We have begun to see movement in the right direction," she says. "That our efforts are starting to pay some real dividends." For Manyiel, her testing experience left her frustrated and exhausted, but now that's she's finally inside the classroom, doing what she wants to do, she's positive about her career. "It made me who I am today," she says. "And if I were to take another test, and I don't pass the first time, I'll be fine! I'm not gonna cry. That's alright." And despite her frustration, Manyiel still believes that taking a test and demonstrating her knowledge is an important step toward becoming a teacher. Updated Nov. 30. 2018 at 9:06 a.m.
A new report released Wednesday finds that many aspects of Maine's education system have improved over the past few decades, including access to public preschool and kindergarten. The findings also suggest that students from economically disadvantaged households are still struggling and are not getting the same opportunities as their peers.